Tucked in a quaint Hutong alleyway in Dongsi Jiutiao, the Red Capital Club is set up with a theme of the “Red Capitalists” of the Burgeoning China. While entering the restaurant, you will notice the Red Flag Limo that used to carry the notable leaders across the city. The interior decor of the Red Capital Club will give you the vibe of the 1950’s China while the Cigar Divan in the lounge looks like the meeting room of Mao. 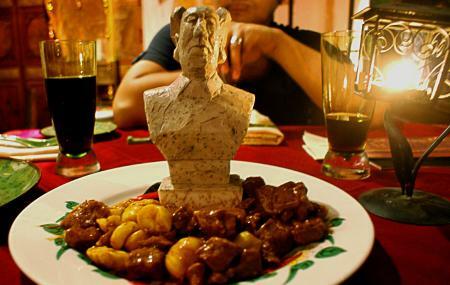 The dishes that you will be served are named with China Imperial history and literature. The kitchen decorated with black and white cats, the bar room with Cultural Revolution artefacts and the dining room with porcelain and Qing Robes are stunning. Bomb shelter bar in courtyard hotel with 5 rooms. But, address is wrong. Really no. 9, 6th alley.